#63 was manufactured by local truck and bus builder Hayes-Anderson in 1937. It was one of 17 PCT-32s built between 1936 and 1937. Before the Second World War, they were the pride of the fleet, but such was the advancement of vehicle technology during the conflict, they were decidedly ‘old fashioned’ when peace returned. They were demoted to second-tier service as newer vehicles arrived. #63 was withdrawn from service in 1951 and donated to the Vancouver Fire Department to be converted into an emergency rescue vehicle. Later, it became a canteen for firefighters. 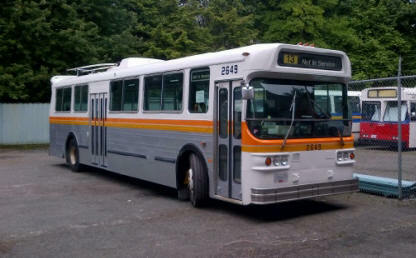 In the early ’80s, it was replaced by another vehicle and returned to BC Transit, which restored it to operating condition. Remarkable as it may seem, #63 is the world’s only Hayes-Anderson bus known to be in operating condition. 2040 is the only survivor of the first and second batches of trolley coaches purchased by the BC Electric Railway in 1947 and 1948. These were the vehicles that ushered in Vancouver’s trolleybus era with the ‘rails-to-rubber’ campaign. There were a total of 82 44-seat vehicles purchased before the company standardized on the larger, higher-capacity T48. Some of these earlier buses were disposed of at a young age in 1962, due to a downturn in ridership and their lower seating capacity. Ten of them were sold to Edmonton, while the rest were scrapped. 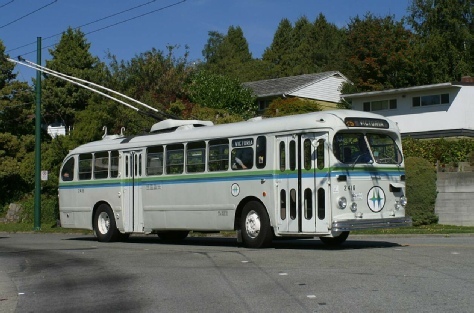 The province’s last T44 trolleybus was retired by the BC Hydro & Power Authority in 1976. #2040 joined the now-defunct BC Transportation Museum. After spending some years in inoperable condition, 2040 has been fully restored to operating condition and sees occasional use in TRAMS excursions. To assist with the “rails-to-rubber” conversion program of the late 1940s/early 1950s, the British Columbia Electric Railway acquired a large number of gasoline-engined Twin Coaches. By 1950, models 34S, 38S, 41S, 44S and 44D were represented on the company’s roster. The BCER numbering scheme identified motor buses with the “M” prefix, to distinguish them as oddities in what was at the time a much larger electric fleet. The “8” signified a bus assigned to the North Vancouver, where rail service succumbed to buses in 1947. 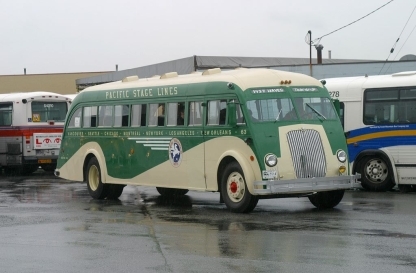 The Twin Coaches were the dominant type of motor bus in the B.C. Electric and B. C. Hydro fleets throughout the 1950s and progressively retired through the late 1960s when GM diesels were acquired in large numbers. 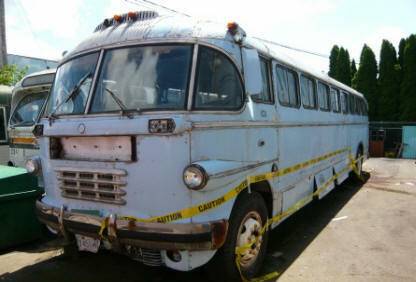 This bus is for sale! Click here for more details. Canadian Car & Foundry licensed this design from American Car & Foundry in the early post-World War II period. As the company’s most popular post-war intercity coach, they were often seen throughout North America. Our example was built in 1947 by the Canadian company but is virtually identical to its U.S. cousins. It provided Pacific Stage Lines’ front line service as #228, and later #6228, until the arrival of MCI Coaches in the early ’60s. It was then sold to Horizon Coach Lines and renumbered #101, serving them as a charter bus until the late ’70s or early ’80s. After its retirement, it was neglected and left to sit outside, falling into a state of disrepair. We acquired it in 2006 with the intention to restore it to operating condition, but decades of neglect had left it with expensive structural damage among other issues, hence our current intention to find it a good home. Canadian Car-Brill T48A No. 2416 was the last trolley coach purchased new by the B. C. Electric Railway. Longer and wider than the earlier T44, it featured a higher seating capacity of 48; most were modified to have single offside seats to accommodate more standees than previous coaches. It was also one of the last trolleybuses built by Canadian Car in Fort William, Ontario. Built in 1954 and retired in 1984, it is preserved today in the livery of the B.C. Hydro and Power Authority, the successor to BC Electric. 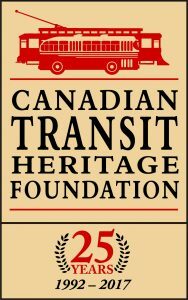 2416 was recently used by the South Coast British Columbia Transportation Authority (TransLink) in the summer of 2018 to celebrate the 70th anniversary of Vancouver’s trolleybus system. #3404 was built in 1957 and retired from regular service in Vancouver in 1977. 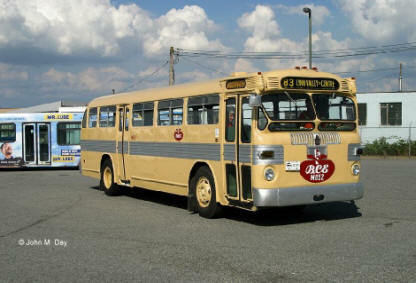 It was then repainted and operated until 1981 as a “Shoppers’ bus,” then retired again. It was moved to Victoria where it briefly operated again on a shoppers’ service sponsored by the Victoria Chamber of Commerce, while owned by the Victoria Electric Railway Association. Falling into disuse, it was donated to TRAMS on July 14, 1999. 3404 is finished in BC Hydro’s popular livery introduced in the early ’60s. Like its sibling, #3405 was built in 1957, retired from regular service in Vancouver in 1977, repainted and operated until 1981 as a “Shoppers’ bus,” retired again, moved to Victoria where it briefly operated as a shoppers’ bus sponsored by the Victoria Chamber of Commerce while owned by the Victoria Electric Railway Association, and donated to TRAMS on July 14, 1999. #3405 is finished in BC Electric’s all-over cream livery it was originally delivered in. The two buses are equipped with British-made A.E.C. “Pancake” diesel engines – a horizontally-laid version of the engine used in London’s famous red double-deckers. 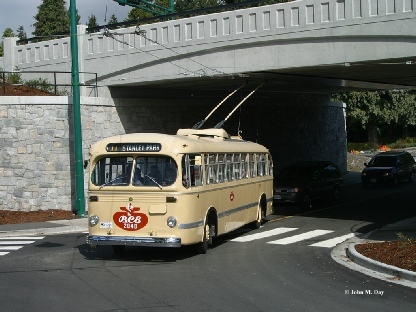 Originally serving in Victoria and later Powell River, Mission and other small communities in B.C., #730 was restored externally and converted to a mobile theatre and historic display vehicle by BC Transit for exhibition at Expo 86 following its retirement. After conversion, it then promoted transit’s Centennial Celebration in 1990. Known as an “Old Look,” this American-built coach was available between the late ’30s and 1959, when it was superseded by the “New Look” or “Fishbowl” as exemplified by #4612 and #4107. 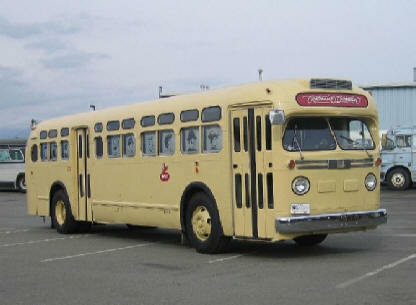 Before the early ’60s, GM coaches were not very popular in Vancouver, being mainly used in Victoria. When the Bureau of Transit Services expanded bus services in 1974, used buses similar to this model were bought from California. #730 is currently gutted for a full interior refurbishment. Last serving Prince George before its retirement in the mid-’80s, #678 was originally delivered new to Victoria as #740. After it was sold in 1987, it ended up in the hands of a private owner and returned to Vancouver Island before being left to sit off the Patricia Bay Highway in the early ’90s. In the early 2000s, #678 returned to the mainland and eventually fell into the hands of 911 Filmcars in New Westminster. It supposedly ran and drove onto the trailer on which it would be brought onto the ferry and across the Georgia Straight. In December of 2018, 911 Filmcars contacted TRAMS with an offer to donate #678 which would otherwise have been scrapped; an offer that was obviously accepted. The bus is currently being evaluated on structural integrity and mechanical condition to determine its fate. If no structural or mechanical issues are found, it will be restored as #730’s passenger-carrying counterpart. 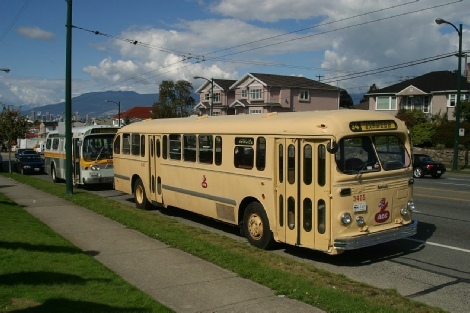 Even though GM vehicles were heavily featured in BC Electric’s Victoria fleet, the Vancouver division mostly standardized on Twin Coach and Canadian Car buses. 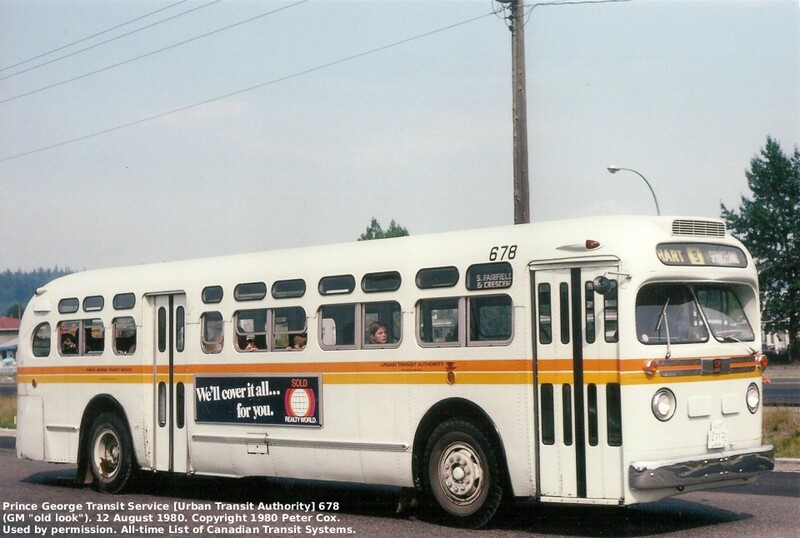 Only in 1964, five years after its introduction to the North American market, did a ‘Fishbowl’ (or ‘New Look’) become part of the Lower Mainland fleet. In this case, BC Hydro had succeeded BC Electric, and purchased 16 such buses for its North Vancouver services. 4612 later served in Burnaby and Surrey on low-ridership routes due to its shorter length of 35 feet. The plan sounded as though it would work: build brand-new coaches with old powertrains recycled from scrapped Brill trolleys, some of which were nearly three decades old. What resulted were buses whose modern appearance wrote checks their old and tired powertrains couldn’t cash. 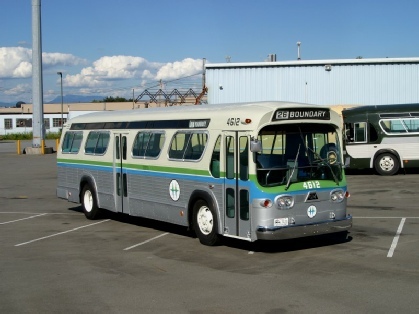 After the E900-series trolleys (with brand-new powertrains) were delivered and placed into service in the ’80s, BC Transit quickly got to work on these coaches, replacing the decades-old electric drivetrains with newer, more potent diesel ones. Our example is one of two converted to trolley wire deicers with modified collection equipment. It was last used by Coast Mountain Bus Company for deicing in 2008. It has since been stripped of deicing equipment, having been superseded by brand-new dedicated deicing trucks. ‘Fishbowl:’ GM would introduce the fifth generation, named Classic, with a major facelift in 1983, though existing ‘Fishbowl’ orders would be produced into 1986 instead of having Classics built in their place. Our example is called a ‘Hillclimber’ because of its turbocharged Detroit Diesel 6V92TA engine and low transmission gearing; the “N” suffix on its model number signifies its lack of air conditioning. #4107 was purchased for North Vancouver, and later ran from Burnaby, Surrey and Port Coquitlam. 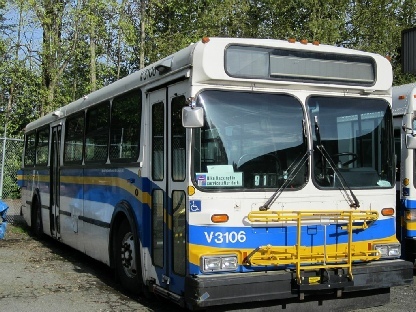 It was finally retired by Coast Mountain Bus Company in 2007 after spending some time in storage. It currently serves as our own reindeer bus every holiday season. 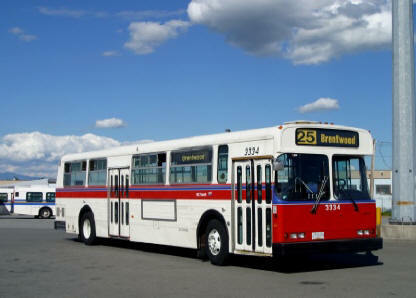 Donated by the Edmonton Transit System, this trolley coach produced by a collaboration between General Motors and Brown, Boveri represents what could have ran along the trolley wires in Vancouver and Burnaby between 1982 and 2008. 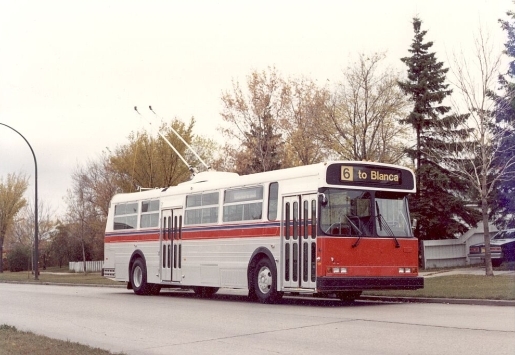 A contender for the large order of trolleys placed in the early 1980s to replace the Flyer E800s and remaining Brills, a competing bid was chosen instead, resulting in the ultimate purchase of Flyer E901A and E902 trolleys that served for more than a quarter century before being superseded by our current fleet of New Flyer low-floor coaches. Meanwhile, Edmonton purchased more than 100 of these unique coaches. In addition to the huge 245-trolleybus order, Flyer Industries also won a contract to supply 35 diesel-powered versions of its 900 series bus. These coaches arrived before their electric counterparts, and some lasted into the new millennium. 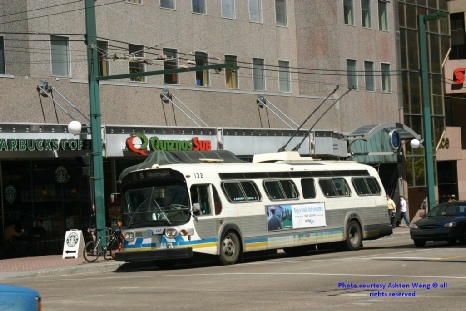 Offered by Flyer from 1981 until 1986, the E901A and later E902 trolley coaches were only purchased new by BC Transit to replace its fleet of Flyer E800s and remaining Brills in the early ’80s. With all-new powertrains, these coaches had the smooth acceleration, power, and modern technology the preceding E800s lacked. All but one of these trolleys, which was engulfed by flames at Oakridge Transit Centre, remained in service until 2008. A number of these trolley coaches were purchased from TransLink by the province of Mendoza, Argentina after retirement, while #2805 and a parts bus were donated to TRAMS. Unfortunately, our coaches were stored outside in a lot during the 2010 Olympics, allowing metal thieves to destroy their drivetrains and propulsion systems, leaving them in an unrepairable state. #2805 was eventually converted to a makeshift office for TRAMS while the parts bus was scrapped. While an unsuccessful attempt has been made to get assistance from New Flyer Industries in repairing #2805, and efforts have been made to purchase and reimport a working unit from Argentina (all of which have now been retired by Mendoza), the chances of seeing an E900-series trolley in operating condition are extremely slim. In 1987, General Motors decided to exit the bus industry, selling its bus designs and factories to other manufacturers. 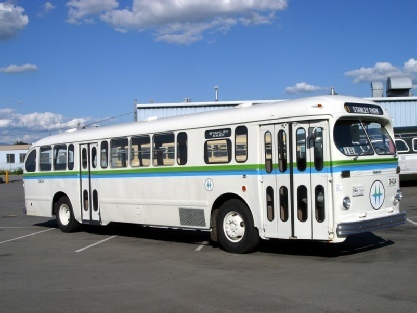 The Quebec plant producing the Classic, the fifth generation of the “New Look,” was purchased by Motor Coach Industries. MCI-produced Classics were completely unchanged from GM-produced units, save for the addition of daytime running lights to Canadian models in December of 1989 and wheelchair lifts to all in 1990. 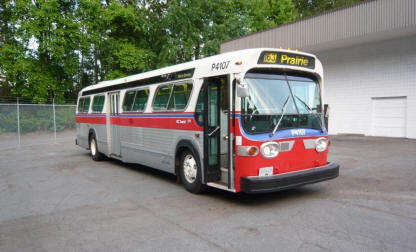 In 1993, MCI decided to exit the transit market and its Classic plant was acquired by then-startup Nova Bus. Nova would continue producing Classics until 1997; it was them who reconfigured the Classic’s drivetrain layout to accommodate modern engines like the Cummins C8.3, giving the “New Look” bus a technical sixth generation. 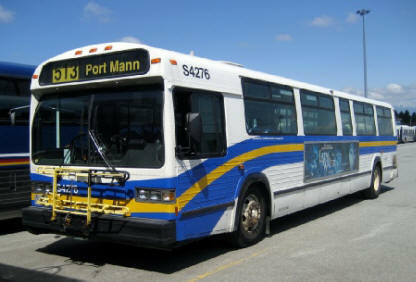 Our 1990 Classic served from Oakridge, Richmond and Surrey Transit Centres until being withdrawn in 2008. The D40, which was later joined by the D35, articulated D60 Galaxy and other models in the High Floor line, was New Flyer’s first all-new model after the company’s formation in 1986. Introduced in 1987 with technologies and manufacturing processes adopted from New Flyer’s then-parent, now-defunct Den Oudsten Bussen, the D40 featured a tubular steel structure with fiberglass body panels for weight reduction. Built and delivered in 1991, #3106 is in a “semi-suburban” configuration, with overhead reading lights and soft, front-facing seats in addition to a narrower rear door compared to its urban-use siblings. As you board #3106, you’ll notice a “Welcome Aboard” sign on the floor where the fare box should be mounted. This is how it ran as an overload bus during the 2010 Olympic Games, its last assignment after serving in Vancouver and Richmond. It was subsequently put up for sale and purchased by a scrap dealer from whom we purchased it in complete, operational condition.